This afternoon the St. Louis Preservation Board will likely approve demolition of Jewish Hospital at Kingshighway & Forest Park Boulevards and the former Jewish Hospital School of Nursing across Parkview Place, which was previously denied demolition because plans for a replacement building were not in place. 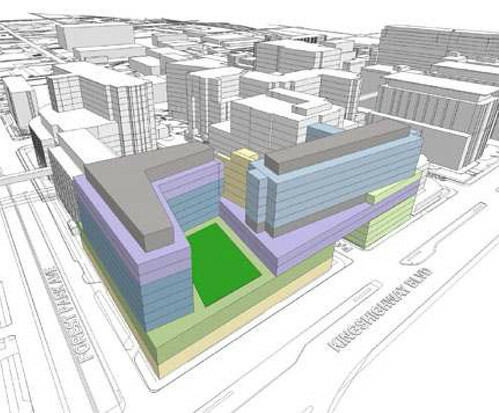 Today though schematic plans are in place to replace the buildings with new bed towers for both Barnes-Jewish and Children's Hospitals atop a joined podium that is proposed to span over Parkview Place. Next STL's post from last week has the full agenda for the Preservation Board meeting. This post is not written to oppose the demolitions, but to reflect on certain aspects of the impending transformation. While the existing building might be able to renovated and retrofitted for uses such as medical office, research or bio-tech space as is being done with the Heritage Building in CORTEX, the old Jewish Hospital and School of Nursing would be very difficult if not impossible to convert into modern functional hospital facilities. 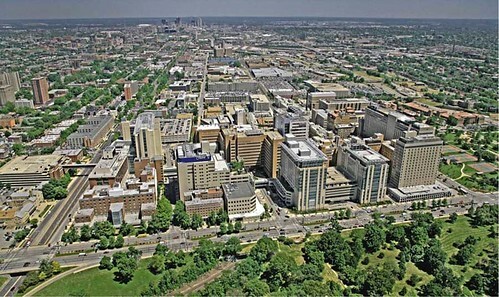 Hospitals are required to meet much higher seismic standards than most other uses. 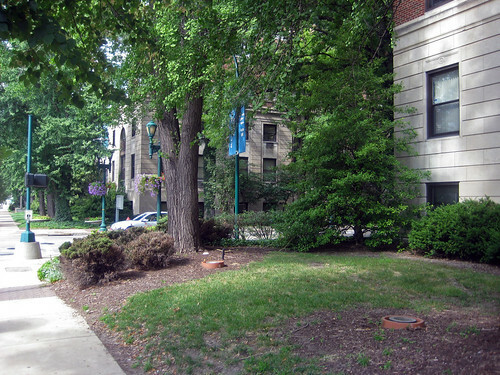 Besides the architecture, one of the most noticeable aspects of the existing buildings are the mature trees and other significant landscaping in the lawns along Kingshighway. 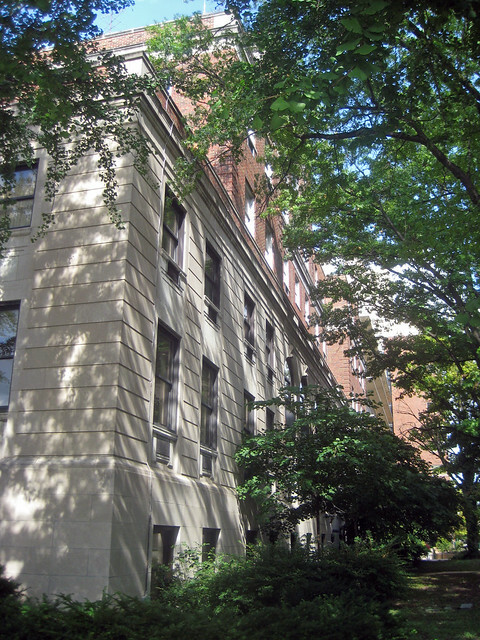 Turning the corner onto Parkview Place, there is a similar mature canopy between the street and the building complex. The tallest portion of the old Jewish Hospital is only seven and a half stories and set back from all surrounding streets on a tiered base. 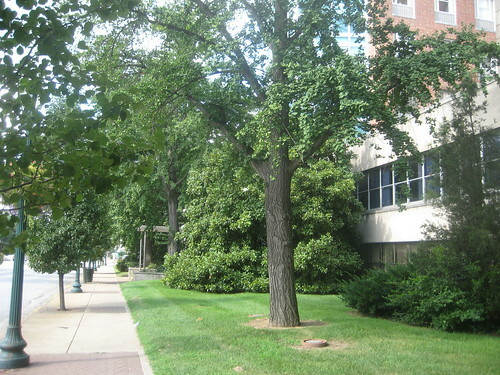 While the six and a half story Jewish Hospital Nursing School building does not have a tiered composition along Kingshighway, the setback from the sidewalk and mature trees gives a similar scale along the block face. 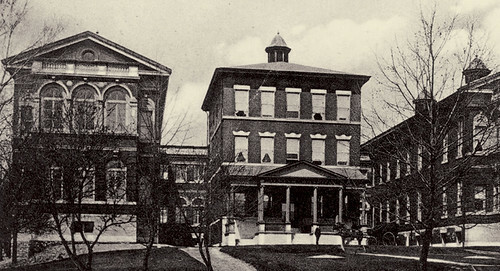 Standing in front of the School of Nursing building looking north, the setback, limestone base, red brick upper stories, similar design and detailing as well as landscaping provide a unifying appearance and scale along Kingshighway. The massing model for the replacement structures show a base of two to four stories with the bed towers rising to about 12 stories, slightly shorter than the Siteman Center at the other end of the block at Euclid. In contrast to newer buildings south of Children's Hospital and the existing buildings to be removed, the base of new structures would not have a setback from the sidewalk. This is similar though to the condition that exists at Queeny Tower, where the parking garage base has no setback. 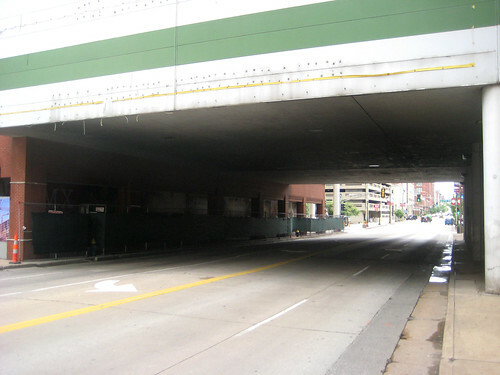 The bed towers on the Kingshighway side would have an angled setback, but would continue up in line with the base along Forest Park Boulevard. 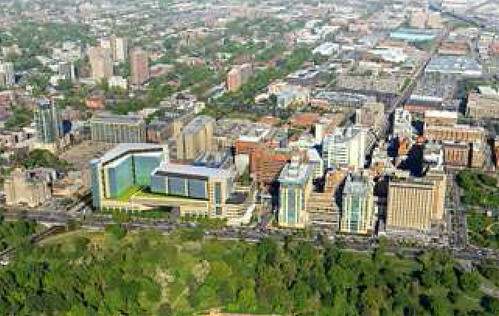 Aerial photos show the existing and proposed buildings at the north end of the hospital campus along Kingshighway. The view above appears to show an angled cutaway in the base (not seen in the massing model) as the building above bridges over Parkview Place. There is precedent for bridging a building over a street on the medical campus. 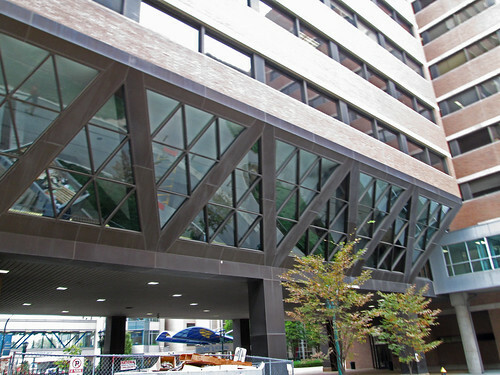 The Clinical Sciences Research Building at the Washington University School of Medicine bridges over Children's Place, although this portion of the street has been converted to pedestrian use only. The large angled trusses on each side of the building successfully narrow the amount of space covered at the street and also provide very interesting spaces at the interior of the building. Anyone designing a building over a street though should be cautioned to avoid creating dark and desolate spaces that occur when the width of the bridge is too wide and the height to the underside is too low. 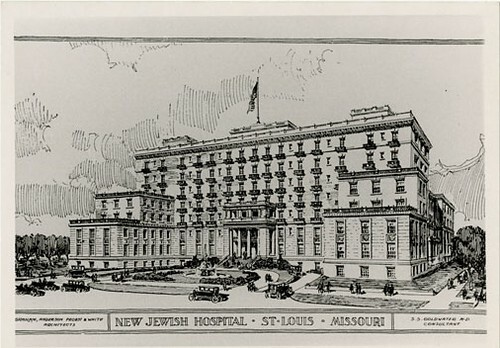 The Jewish Hospital of St.louis began with its first building located at 5415 Delmar Boulevard which opened in 1902 only able to house 30 beds. It was expanded in 1905 with symmetrical wings that brought the bed count to 100. By 1913 this expansion proved too small and land at Kingshighway & Forest Park Boulevards was purchased in 1915 as a site for a new facility. The building on Delmar was purchased by the neighboring Masonic Home who significantly remodeled it and built a twin building to the east. 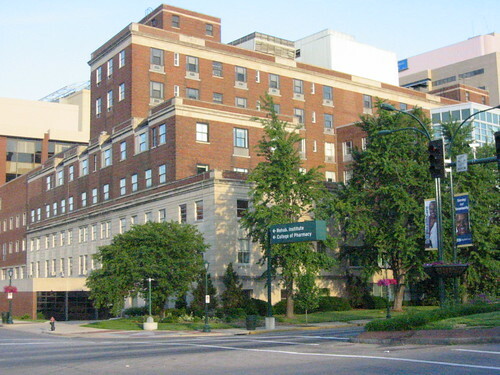 The site is now the location of the St. Louis Regional Psychiatric Stabilization Center, which was built in the mid-1990's. Above is the architectural rendering by Graham, Anderson, Probst & White of Chicago for the new Jewish Hospital on Kingshighway which was dedicated on May 16, 1926. The School of Nursing was opened three years later and connected to the hospital by a tunnel under Parkview Place. 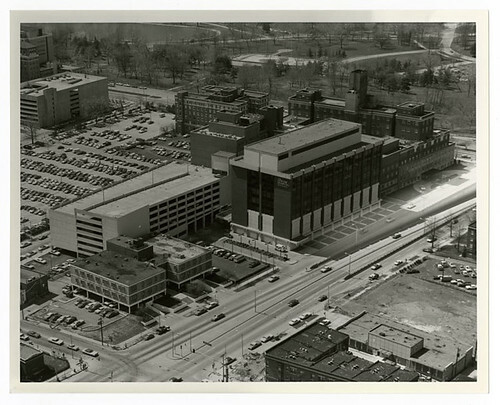 In 1956 the center wing was added to the hospital and the courtyard facing Kingshighway was infilled with a two story addition. Above is a photo of the new modern lobby created with the expansion. 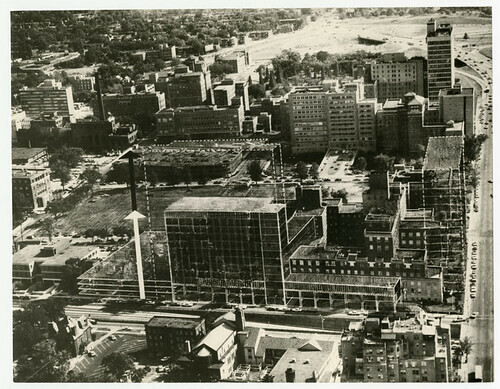 The idea of going vertical at the Jewish Hospital site along Kingshighway is not new. This study drawing from the late 1960's shows a highrise addition along Forest Park Boulevard and second future tower in front of the original hospital along Kingshighway. The Schoenberg Pavilion by Schwarz & Henmi Architects was opened in 1974 at eight stories in height, but a newspaper article about the building stated that the building was designed to be expanded vertically up to twenty stories. 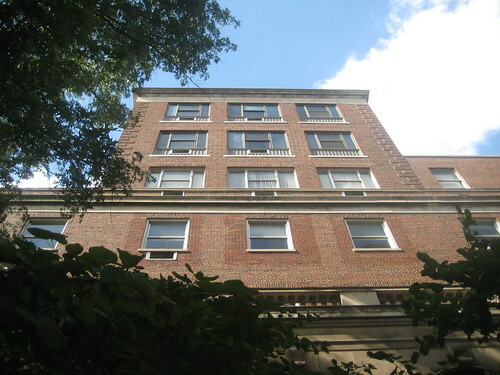 The Schoenberg building is the only portion of the Jewish Hospital complex that will not be demolished with the new expansion plans. 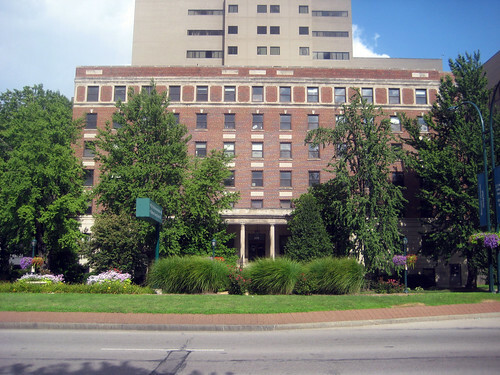 While Barnes & Jewish Hospitals formed an affiliation agreement in 1992 that led to the creation of BJC and officially merged in 1996, the old hospital building at Kingshighway & Forest Park for many retained the identity of Jewish Hospital. For many Barnes Hospital with the large East & West Pavilions facing Highway 40 still retains its identity. 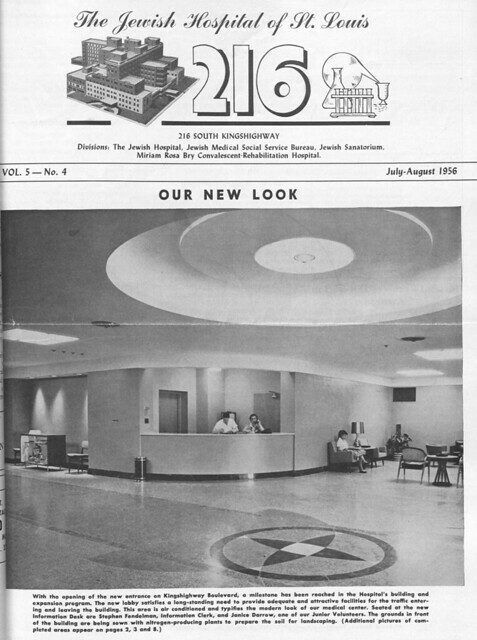 A recent article in the Jewish Light reflects on this passing of the independent identity of Jewish Hospital. Last week a resident of the 4400 block of Washington Boulevard informed me that this beautiful three story home at 4474 Washington had recently been demolished. I had included a few photos of this house and it's twin neighbor 4476 in a post I did last year about a another demolition on the same block. 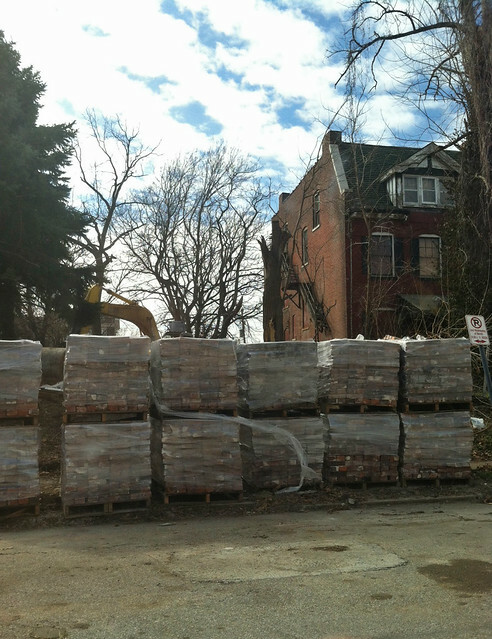 This photo by the resident of the block shows the home reduced to pallets of brick wrapped in plastic. Its twin with a different dormer design still stands next door. The home had been vacant for many years, but was in relatively good condition except for a portion of the rear wall and a small section of roof over this area. A rear porch which shows up in an aerial view from just a few years ago had collapsed from what appears to be fire damage. The main house though was only damaged in the rear where the opening in the wall occurred. The isolated collapse was likely caused by water pressure from a fire hose. At just over 3,000 square feet, the house which was built in 1905, was not small, but it was still smaller than many houses on this stable block that have been rehabilitated in the last several years. The home was condemned for demolition by the City in June 2012 and according to the City's property records, it's recent demolition cost the City $9,300.00. This home is a perfect example of where a mothballing program by the City of St. Louis could have resulted in preservation of this handsome structure. A temporary roof at the rear section of the home and framing in the three story opening in the rear wall, which would secure and stabilize the house until rehabilitation, could likely have cost less than the demolition. A view of the east side of the house shows the structure in sound condition, with original windows still fully intact. The fire escape indicates that the house may have been divided into apartments at or used as a rooming house at one time. 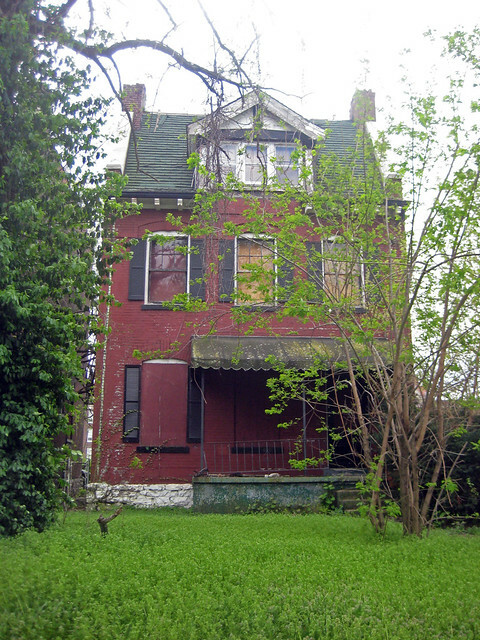 The home had been owned by a corporation with an address in Maryland, and according to City records, property taxes had not been paid for 2010, 2011 or 2012, meaning that instead of being demolished, it could have gone to a tax sale early this year and been bought by someone who would rehab it. If no one happened to bid on it, LRA would have taken ownership and an RFP could have been issued for purchase and rehabilitation of the home. While the real estate market is not (and likely won't be) where it was before the crash in 2008, a local real estate agent told me last week that demand for existing homes in the City is outpacing supply of for sale homes this spring. A view inside the rear of the house shows some smoke and water damage at the ceiling, but the structure is still fully intact. The fire had not spread through the main portion of the house. While the photo above isn't pretty, the home was still very much in restorable condition. The surviving twin at 4476 Washington is also vacant but is well secured. The owner according to City records lives in the 5700 block of Pershing, and there are electrical permits listed as recent as 2005. 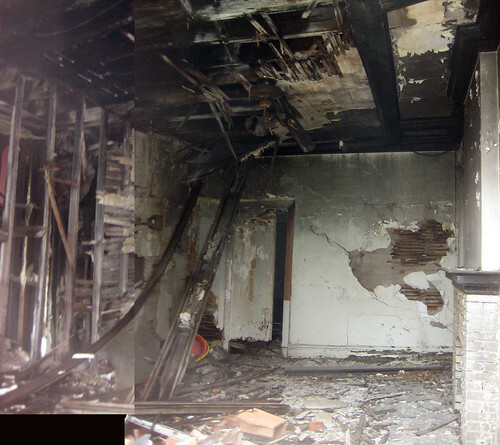 It should be noted that the demolition of 4474 Washington took place without a review by the Cultural Resources Office. 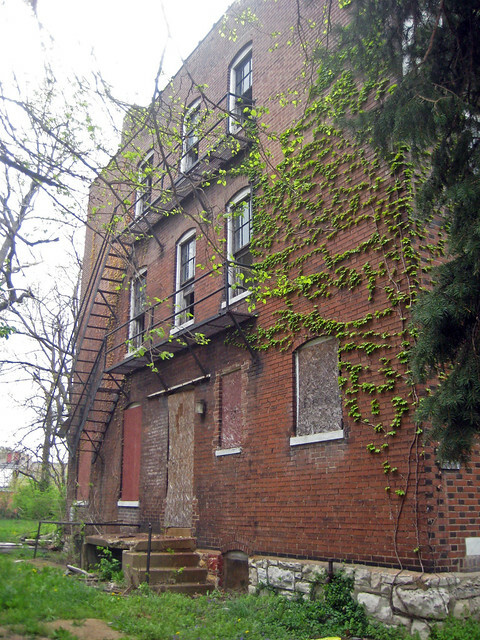 The home was located in the 18th Ward, which lacks Preservation Review and it is also located on a block that was excluded from an expansion of the Central West End Historic District by Alderman Terry Kennedy. 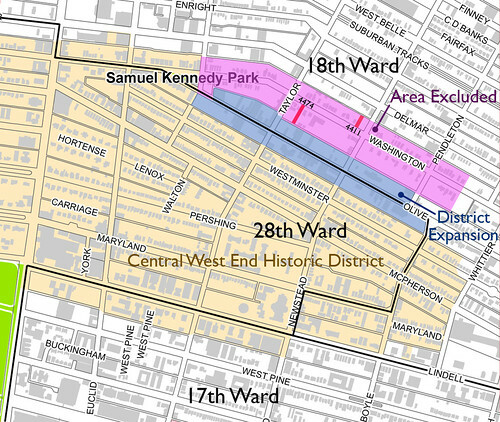 The map below shows the expansion of the Central West End Historic District district in blue and the blocks of Washington that were excluded by Alderman Kennedy in pink. The red colored lots are the locations of the demolition last year of 4411 and the recent demolition of 4474 Washington. Including these blocks would ensured review by the Cultural Resources Office that could have resulted in preservation of these homes. 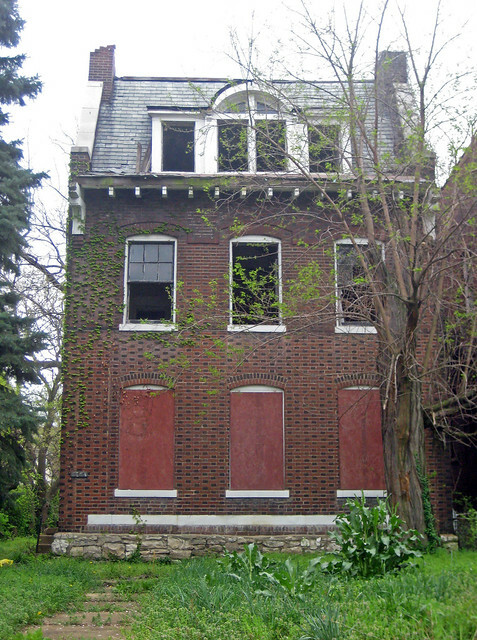 The homes would also have been eligible for the 25% Missouri Historic Rehabilitation Tax Credit for substantial rehabs. 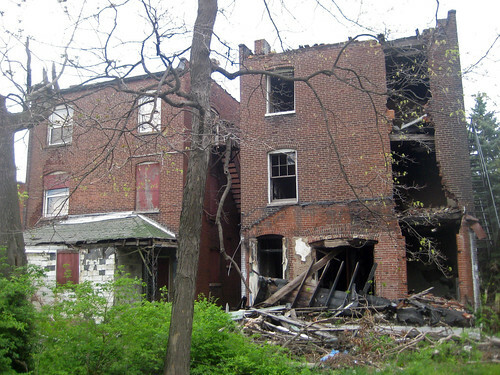 At a mayoral forum held by the American Institute of Architects - St. Louis the week prior to the primary election, Mayor Slay pitched the idea of a revolving fund to mothball vacant buildings. 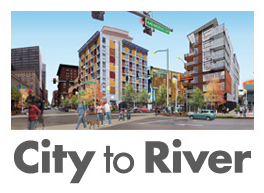 This strategy is outlined as a short term goal in the Urban Character, Vitality & Ecology section of the City of St. Louis Sustainability Plan that was formally adopted by the City in January. It is time to enact this strategy, which would result in fewer un-needed demolitions and could actually save the City some money. Enacting City-wide Preservation Review would also elevate historic preservation from a political shell game to a strategy for revitalizing the entire City. Last night I attended the Grand Center Great Streets open house that mostly focused on the streets in and around Grand Center and what should be done to improve them for all users including pedestrians, bikes and cars. Some of the boards also dealt with the problems associated with the uses of many properties fronting the streets, mostly being surface parking lots. One board showed several buildings in red that have been determined to be buildings that should be demolished for other uses. Most I would agree can go away, including the gas station on the island of asphalt at the northwest corner of Spring and Olive and the concrete block pillbox that was made famous in 2010 for being the site of the largest cash heist St. Louis history (no that doesn't make it historic). I was surprised however to see this building at the corner of Washington and Theresa on that board. 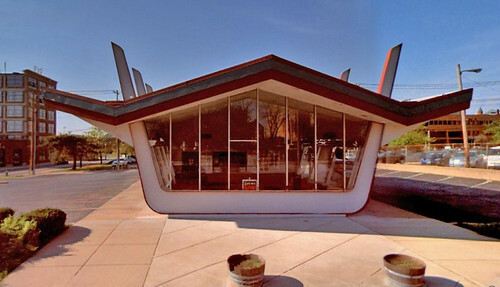 While I admit that this building isn't the best form an urban design standpoint (it stands in the middle of a parking lot), it is a unique piece of Googie architecture that should not be dismissed so quickly. The building was constructed in 1969 for NEBA Roast Beef and there are only a few of this type left in the country (thanks Debra Jane Seltzer for the info). St. Louis does not have many great examples of this typology, which has been given greater credibility with the restoration of the Flying Saucer on Grand. Great streets like Lindell Boulevard have all kinds of architecture that make them interesting. 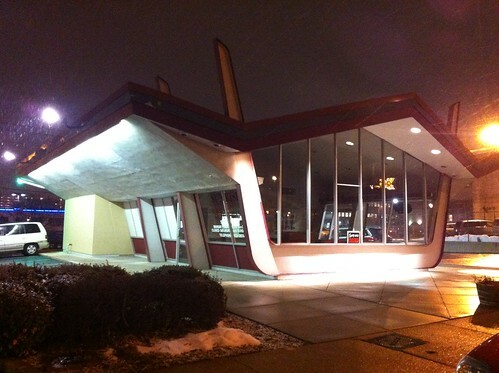 This building would make a great art gallery or continue as a restaurant. Either way, lets focus on filling up all the other giant asphalt lots in Grand Center with buildings and other uses first. There is a survey for the overall project linked from the page GrandCenterGreatStreets.org. Please take the survey and tell Grand Center what you think of this building.